The traditional Japanese offering stand or 'Sanbo' box is a very popular model especially for kids as it's very simple to make and I think it fits in nicely with the origami crane model when they are displayed together. Use this box to keep you little nicknacks, jewelry, and small stationary items or to serve little sweets or snacks at a party! Make a larger box for gift-giving. You only need one sheet of square paper for this simple model and a few minutes. It's possible to teach this to kids as well. 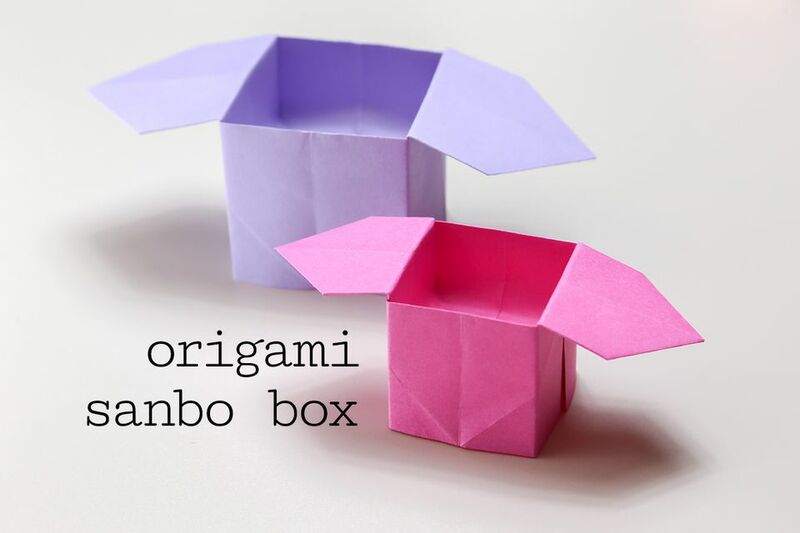 If they are total beginners, perhaps start with the origami masu box first. You might want to use paper that is a bit thicker than regular origami paper for this one. 1. Start by folding the paper in half both ways. 2. Fold all 4 corners to the center. 5. Fold the bottom edge up to the top. 7. Fold the paper in half to the left. 9. Pul the left and right sections inwards and the top down. 10. Rotate the paper so that the open section is at the top. 11. Open out the from layer as shown. 12. Flatten the section out. 13. Flip the model over to the other side. 14. Do the same on this side. 16. Open the model out like turning the pages of a book, to get to the remaining sides. 18. Fold to top layer only, fold the right edge to the center. 19. Fold the left edge to the center. 20. Fold the top point down to the bottom. 21. Flip the model over and do the same on that side. 22. Open out the model by pulling as shown. 23. Open out the box and straighten it all out. 24. Your box is now complete.